over a seven-year period, and was seen on quite a few covers. Under one or another of its many publishing names, Marvel even did "The Angel Detective" as a pulp character, albeit only for one issue (July, 1941), and the resemblance wasn't exact. The character was created by cartoonist Paul Gustavson, who wrote and drew his first adventure as well as many later ones. He worked throughout Marvel's 1940s line, and had credits at several other publishers, including DC. A lot of his work was done for Quality Comics, where he handled Blackhawk, Kid Eternity, Uncle Sam and various others, and created The Jester, The Spider and The Human Bomb. Gustavson freely admitted he'd been inspired by pulp writer Leslie Charteris's famous hero, The Saint, who remained popular over a period of decades, with a few novels still in print even today. His first story, which appeared in Marvel Comics #1 (November, 1939, and, by the way, the publisher's very first comic book), did not disclose how he became The Angel. A non-human origin was sometimes hinted at in early stories by having him cast a shadow with large wings, but there was never a clear and unambiguous statement to that effect. 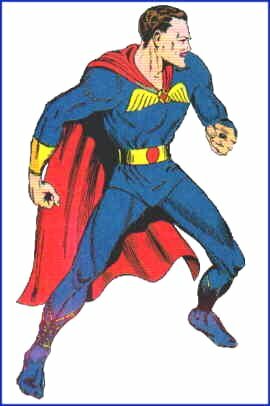 He didn't maintain a secret identity at first, but was addressed as "Angel" even when wearing a regular suit rather than his stylized blue tights with red cape and yellow wings as a chest emblem. His only super power was an occasionally-exercised ability to fly, and many perfectly human superheroes have that. Anyway, it was attributed to the aerodynamic qualities of the cape. Later, he did have a secret identity, private detective Tom Halloway. A text page written by Ray Gill (who also has credits at Lev Gleason, Novelty Press and elsewhere) in Marvel Mystery Comics (as Marvel had been re-titled with its second issue) #20 (June, 1941) gave his background. Halloway's mother had died in childbirth and his father, a prison warden, had raised him in the prison, isolated from outside human contact except for the experts the warden brought in to teach the boy everything there was to know — successfully, it appears, as his range of knowledge sometimes seems to have rivaled that of The Junior Woodchucks' Guide Book. The Angel (who, by the way, was one of the few superheroes with facial hair — like The Wizard, he wore a pencil-thin moustache) continued in Marvel Mystery Comics until #79 (December, 1946). He was also in the back pages of the first 21 issues of Sub-Mariner, and made a few odd appearances in such minor titles as Mystic Comics and Daring Comics. But when he finally did disappear from view, he wasn't revived. Even during and after the 1960s, when it became a positive mania for comics publishers who went back that far to bring their old costumed heroes back, The Angel wasn't one of them. Maybe that's because of the possible confusion that might result from their having a new character by that name in The X-Men, but whatever the reason, The Angel who was a contemporary of The Masked Raider (no relation), Ka-Zar and the other heroes of Marvel Comics #1 went decades without turning up. That was remedied in recent years, as the supply of old-time characters to bring back eventually petered out. He's been seen in company with The Incredible Hulk, Cloak & Dagger, and Captain America's old enemy, The Red Skull. But with the new guy ensuring Marvel will never lose the trademark on the name, it seems unlikely he'll become a major star again.